The Old Carrabelle Hotel opened for business with innkeepers Kathy and Skip Frink on the 4th of July, 2002, very likely in the first years of the building’s 3rd century! Old county records are sketchy on the subject, but enough word-of-mouth evidence exists to put the original construction in the late 1800’s. It seems that the first use of the property was as a railroad hotel, serving the railroad line from Tallahassee that ended in a spur where the Carrabelle Volunteer Fire Department currently stands. The old Coombs sawmill was across the street (now Gulf State Community Bank property), preparing cypress and other woods for transportation by rail and schooner. Another opinion is that it may have been home to the sawmill manager of the time. But oral history moving forward into the 1920’s seems to agree that the Gray family, still in Carrabelle, owned it as their home for 20 or 30 years. The first dated family photo proof is 1938 Christmas. In the War years when Carrabelle turned into the amphibious training base for the Normandy invasion, most of the famous “brothel” rumors originated. Ownership (and use) of the hotel is unclear until after the war, when it is shown in a picture now hanging in the lobby to be the “Carrabelle Hotel”. Skip, in the remodeling process, found evidence that there was only one bathroom, on the ground floor. There were “three johns, side by side with no stall partitions, 2 sinks and a bathtub. Seems it was a very social bathroom”. The 1950’s saw Captain Leon Langston, Carrabelle’s original deep-sea charter captain, make the old place his showplace family home. Years after the death of both parents, son David sold the property to Weldon Vowell, the (self) acclaimed Donald Trump of Carrabelle. Weldon, desiring to move his business to Panacea, sold to Skip, Kathy and partners in May, 2001. Kathy fell in love in Carrabelle. “No, not with Skip, with Carrabelle. I started coming to Carrabelle Beach in the 1960’s on family vacations. We even went out sometimes with Captain Langston on his Queen of Queens.” Family and careers intervened, then in the mid-90’s she visited here with Skip and son Nathan, just for old times’ sake, staying at the Riverside Motel (where C-Quarters Restaurant/Marina now stands). That was when Skip got hooked (“Not on Kathy, on Carrabelle”). Fast forward to the 2001 Chili Cook-Off on St. George Island. The couple was invited, by friend Rose Tortorici, to stay at a row house nearby that was chock full of Atlanta Parrot heads. In spite of the bonhomie, Kathy chanced to get into her favorite reading, a real estate magazine. “Look, the old hotel is for sale!” And the rest is history. Atlanta friends Debbie and Will Brown came in for part of the purchase, and for a lot of the work. “Foreman” Skip, who has years of experience in remodeling, on Day 1 had three helpers ready to go, with paint cans and brushes. Painting is usually the last trade hired, but in this case the foreman was allowed no choice - it had to be first, and this led to a lot of friendly confrontations throughout more than a year of work. (Debbie’s painting resume includes mention of the fact that she has never cleaned a brush or a pan, and Skip has never thrown anything away-ask Kathy). But the friends remained friends, and on the 4th of July the following year, the house was booked all weekend. Exactly what layout was original is difficult to determine, even though the work got into moving walls and doorways, exposing the structure. But it is clear that after the time of the “3 johns” downstairs, the west side porch on the second floor was enclosed to form two bathrooms, men’s and women’s. Those three bathrooms still remain, highly renovated, and serve as the innkeepers’ on the ground floor, and Flamingo and Regatta baths on the second floor. Baths for Hemingway and Magnolia had to be created from scratch. “The guys from M&L Plumbing were great to work with”, Skip comments. “I had to do things like raise floor levels and lay tile exactly where their bathroom fixtures would go” to suit the installation schedule which ran for 3 weeks (every pipe was replaced from the street in, a water heater added to run in tandem with the other, and new fixtures added). “So all the bathrooms had tile ‘paths’: through the doorway, over to the toilet and over to the sink. I didn’t have time to do the whole room, since they put in all 5 bathrooms at once”. (The finished product is seamless.) To date, not one service call. The plumbers had an advantage over Ronald Gray’s A/C crew, however. There was no central heat and air when Ronald was there (summertime). The inn now enjoys climate control running like a top, with separate heat pump units in the attic and under the house which can be controlled separately, or shut off if not needed. To date, not one service call. And of course, all trades worked around the painting. Will, a career banker, divided his efforts between watching money disappear and helping Debbie make paint disappear from her bucket (onto the hotel). Or doing back-breaking yeoman landscaping labor, as time and weather permitted. There were many times when Carrabelle Junction, Willie’s, Tiki Hut or Julia Mae’s hosted a very tired and hungry group of four (or five, as Nathan devoted all his year’s vacation time to work on the hotel). 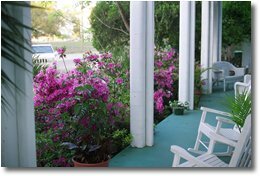 The Old Carrabelle Hotel can be visited at www.oldcarrabellehotel.com, which has photos of all guest rooms and public areas. Currently there are four themed upstairs bedrooms with private baths, wraparound porches on both floors, the Monkey Bar (where Chuck Spicer can occasionally be found holding forth – or holding onto something for support), living and dining room guest areas and the Key West courtyard. The carriage house (still has 5 doorways for carriages) is to be a future project. And next door up the street, the Oyster Cabin is a rental efficiency apartment complete with loading dock. What now that most of the work is done? Kathy: “Well, now we can relax. We escaped Atlanta, you know, and all that rat race. So, Skip remodels, is active in the Carrabelle Chamber of Commerce, is running the Riverfront Festival, working to bring Habitat for Humanity, the Tourist Tax and the Big Bend Scenic Byway to Franklin County and writes occasionally for local papers. I went through real estate school and am now working the 7-day a week spring realtor schedule, will soon start study to get my Florida mortgage broker license…oh, and of course we run the Old Carrabelle Hotel”. Since our neighboring towns of Apalachicola and St. George Island have just come under the focus of a recent Sports Illustrated Swimsuit Edition feature, we are becoming a good choice for lodging that is a little more quiet and out-of-the-way, yet still centered in the eco-touring heart of the Forgotten Coast.